During the 11 seasons their respective careers overlapped from 1982-92, Mike Scioscia and Don Mattingly lived separate lives in the baseball universe. Each played more than 1,400 regular-season games and wore only one Major League uniform as a player. But because interleague play didn’t arrive until 1997, and Mattingly’s rookie season was one year after the 1981 Dodgers-Yankees World Series, Scioscia and Mattingly appeared in only one game together. 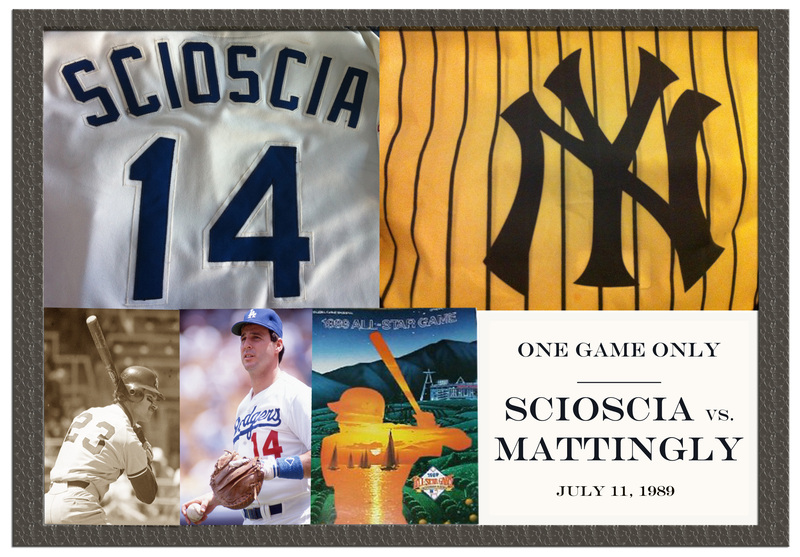 The 1989 All-Star Game in Anaheim was the first of Scioscia’s two All-Star selections. He was named to the 1989 National League squad as a reserve by Dodgers manager Tommy Lasorda. In 1990, Scioscia became the first Dodger catcher to start an All-Star Game since Hall of Famer Roy Campanella in 1954. Mattingly was a six-time All-Star first baseman in consecutive seasons from 1984-89. The 1989 All-Star rosters featured Tony Gwynn (Padres), Tim Wallach (Expos), Pedro Guerrero (Cardinals), Barry Larkin (Reds) and Eric Davis (Reds). The Dodgers were represented by Scioscia, second baseman Willie Randolph, starting pitcher Orel Hershiser and reliever Jay Howell. The American League squad included Wade Boggs (Red Sox), Bo Jackson (Royals), Mark McGwire (Athletics), Steve Sax (Yankees), Jeffrey Leonard (Brewers), Kirby Puckett (Twins) and Nolan Ryan (Rangers). Jackson and Boggs opened the American League’s first inning with home runs off San Francisco’s Rick Reuschel and the A.L. scored five runs in the first three innings en route to a 5-3 victory. The Scioscia-Mattingly showdown? Unfortunately, there is no photo of the future Dodger manager at the plate with Scioscia giving signs to the pitcher. They were in the game at the same time for just one inning. Scioscia replaced starting catcher Benito Santiago (Padres) in the fourth inning. He flied to left field in the fifth inning in his only at-bat against Mike Moore (Athletics). Tony Pena (Cardinals) pinch-hit for Scioscia in the top of the seventh. Mattingly entered the game on defense in the sixth and his only at-bat occurred in seventh and he doubled off Howell. Scioscia and Mattingly were actually “teammates” three years later during the February 20, 1992 episode of The Simpsons. The animated television show used the voices of Major League players as part of a storyline in which Homer Simpson’s boss, Mr. Burns, hires players for his Springfield Nuclear Power Plant softball team: Mattingly, Scioscia, Wade Boggs, Ken Griffey Jr., Roger Clemens, Steve Sax, Ozzie Smith, Jose Canseco and Darryl Strawberry. But eight of the nine ringers end up missing the game for various reasons. Scioscia’s character gets radiation poisoning from working at the power plant. Mattingly’s character is fired by Mr. Burns for refusing to shave his nonexistent sideburns. Many assume Mattingly’s storyline was a parody of the real-life incident in which the Yankees insisted their star player get a haircut or be benched. But the Simpsons episode was written a year before the haircut controversy.